Alloy rims are the absolute eye-catcher on every vehicle. The visual effect is also complemented by other benefits such as less weight, reduced rolling resistance and fuel economy. Since aluminium is much lighter than steel, it will also improve the dynamics of your vehicle. Rims of this material are often powder-coated, which makes them particularly resistant to environmental influences and counteracts excessive corrosion. Of course, when choosing an alloy rim, it is important to pay particular attention to which rim fits which car. 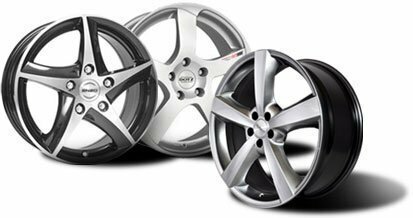 Alloy rims are available in various sizes, shapes and colours and for all common vehicle models. You will quickly find affordable aluminium rims that are right for you, and that can boost your car not only visually. Alloy rims are also good to use in winter because slush with salt additives can only slightly damage the rims’ coating. When it comes to stability, these alloy rims are in no way inferior to steel rims. The care of an aluminium rim is effortless: dirt and brake dust are easily washed off. For stubborn dirt, even a pressure washer can be used, but be careful that the metal nozzle does not hit the rim coating. If you want to equip your car with new alloy rims, you should most certainly check the offer on Tirendo.co.uk. Browse our assortment and buy your aluminium wheels in the UK cheaply online. With the rim configurator, you will swiftly find the matching alloy rim.